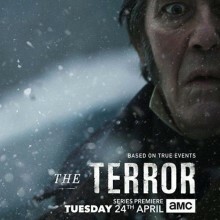 Christos Lawton and Chris Corrigan feature in much anticipated TV outing of the Ridley Scott’s produced ‘The Terror’ on BT TV at 9pm on 24th April. Christos Lawton and Chris Corrigan star in new hotly anticipated TV series of Ridley Scott’s production of ‘The Terror’ on BT TV at 9pm on 24th April. ‘The Terror’ is an American horror drama television series based on the 2007 best-selling novel of the same name by Dan Simmons. The ships are soon stuck, frozen and isolated, and those aboard must survive the harsh weather conditions and each other, while being stalked by an elusive menace.